LOUDON, N.H. — The Chase for the Sprint Cup was hatched in the aftermath of a mind-numbingly consistent performance by Matt Kenseth, who won the 2003 title despite only one victory. A decade later, he seems to be taking the opposite approach to a championship march. Not that either path matters to the unassuming and workmanlike star from Cambridge, Wis.
"If you're fortunate enough to win a championship, I don't think there's a bad way to win it," Kenseth said after remaining unbeaten Sunday in the Chase with a victory in the Sylvania 300 at New Hampshire Motor Speedway. "I know it still gets brought up we won one race because it was the last year before the Chase, but I still was really proud of what we did that year. "Your goal every year is a championship. Either way would be special beyond words." --He led 92 of the final 93 laps and added another exclamation point to a career year in his 14th season — and first since moving to Joe Gibbs Racing — with a series-leading seventh win (his previous best for a season was five in 2002). --He broke through for his first victory at New Hampshire in 28 starts (and his fourth this season at a track he previously hadn't conquered), earning his first top five on the 1.058-mile oval in eight years ("I probably had more anxiety over (New Hampshire) because I feel I'm the weak link. It doesn't seem real that we won."). --He became the second driver to win his 500th start in NASCAR's premier series (joining Richard Petty) and the third to open the Chase with two consecutive wins (matching Greg Biffle in '08 and Tony Stewart in 2011; Stewart went on to win his third championship). The bevy of accomplishments were enough to leave the normally stoic Kenseth tearing up behind his sunglasses during victory lane interviews. "Absolutely not," Kenseth deadpanned with a smile when asked if he'd gotten emotional. "I'm just happy. It's just been an unbelievable year. I've made a lot of friendships and really feel at home there. I enjoy being part of it and having success on top of it." What might be daunting for the rest of the Chase field is the success doesn't seem likely to end anytime soon. 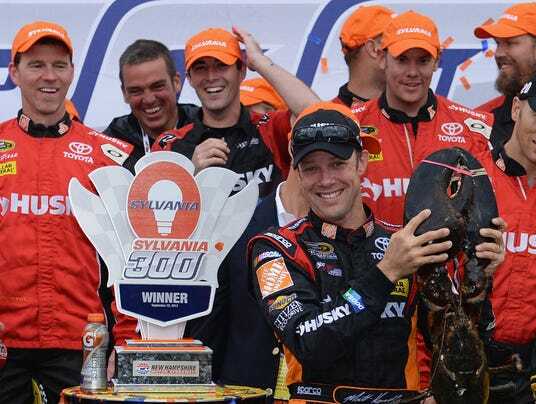 Kenseth has triumphed within the past two years at the next four tracks on the circuit — Dover International Speedway, Kansas Speedway (where he has won the past two), Charlotte Motor Speedway and Talladega Superspeedway. The weakest track ahead is Martinsville Speedway — a flat track similar to New Hampshire where he hasn't won yet but is confident after leading 96 laps with his No. 20 Toyota in April. "There's really not a track I'm not looking forward to going to, to be honest," Kenseth said. Kyle Busch, who finished runner-up for the second consecutive race but fell further behind in the points, said his JGR teammate will be tough to beat when he has a "special car" as he did at New Hampshire. "He's one of the best," Busch said. "That's why he's here. He's put it all together." Kenseth's results have been no surprise to Biffle, who was Kenseth's Cup teammate from 2002-12 at Roush Fenway Racing. "We all knew they were going to be tough when the Chase came, certainly," Biffle said. "I won the first two Chase races before and then didn't win the championship. Anything can happen. But they have good momentum, and they've got good, fast cars." Kenseth also has a sizable bulge in the standings through only two races. He leads Busch by 14 points and five-time champion Jimmie Johnson (fourth Sunday) by 18. Johnson, who often is booed at tracks by race fans who perceive him as boring or are tired of seeing him win, reached out to Kenseth after the race by tweeting: "Congrats @mattkenseth. Careful though, you keep winning like this and they'll start booing you." The gap to fourth-ranked Carl Edwards is 36 points. Last year, there were 11 drivers within 35 points of the leader after New Hampshire. If the margin keeps growing, it could create interesting symmetry for Kenseth, who clinched his first title in the season's penultimate race. That helped prompt the inception of a points reset to ensure the championship was decided in the finale — as it has for all nine editions of the Chase. Until perhaps this one. Not that it would matter to Kenseth. "I don't think there's a magic formula," he said. "You just have to have more points than whoever finishes second. That's how you win (the title)." 1. (9) Matt Kenseth, Toyota, 300 laps, 141.5 rating, 48 points. 2. (12) Kyle Busch, Toyota, 300, 112.7, 42. 3. (10) Greg Biffle, Ford, 300, 97.3, 41. 4. (11) Jimmie Johnson, Chevrolet, 300, 116.7, 41. 5. (23) Jamie McMurray, Chevrolet, 300, 94.2, 39. 6. (17) Dale Earnhardt Jr., Chevrolet, 300, 103, 39. 7. (29) Brian Vickers, Toyota, 300, 91.1, 0. 8. (25) Jeff Burton, Chevrolet, 300, 91.7, 36. 9. (26) Carl Edwards, Ford, 300, 86.1, 35. 10. (5) Martin Truex Jr., Toyota, 300, 120.7, 35. 11. (20) Brad Keselowski, Ford, 300, 102.1, 34. 12. (14) Denny Hamlin, Toyota, 300, 93.6, 32. 13. (4) Kurt Busch, Chevrolet, 300, 81.8, 31. 14. (6) Joey Logano, Ford, 300, 90.5, 31. 15. (3) Jeff Gordon, Chevrolet, 300, 105.7, 30. 16. (1) Ryan Newman, Chevrolet, 300, 82.8, 29. 17. (16) Clint Bowyer, Toyota, 300, 76.9, 28. 18. (22) Marcos Ambrose, Ford, 300, 69.9, 26. 19. (15) Juan Pablo Montoya, Chevrolet, 300, 67.5, 25. 20. (8) Kevin Harvick, Chevrolet, 300, 73.9, 24. 21. (13) Aric Almirola, Ford, 300, 67.7, 23. 22. (7) Paul Menard, Chevrolet, 300, 70.4, 22. 23. (18) Mark Martin, Chevrolet, 300, 64.4, 21. 24. (31) Ricky Stenhouse Jr., Ford, 300, 62, 20. 25. (34) Casey Mears, Ford, 300, 57.7, 19. 26. (35) David Reutimann, Toyota, 300, 55.8, 18. 27. (21) Danica Patrick, Chevrolet, 300, 57.1, 17. 28. (30) Travis Kvapil, Toyota, 300, 51.9, 16. 29. (19) David Ragan, Ford, 299, 54.6, 15. 30. (27) Michael McDowell, Chevrolet, 297, 43.4, 14. 31. (38) Dave Blaney, Chevrolet, 297, 41, 13. 32. (43) Josh Wise, Ford, 297, 39.4, 0. 33. (37) J.J. Yeley, Chevrolet, 296, 44.8, 12. 34. (32) Landon Cassill, Chevrolet, 296, 43, 0. 35. (36) Joe Nemechek, Toyota, 296, 33.7, 0. 36. (42) Timmy Hill, Ford, 293, 27.4, 8. 37. (2) Kasey Kahne, Chevrolet, 278, 97.6, 8. 38. (33) Kevin Swindell, Toyota, 244, 32.1, 0. 39. (24) David Gilliland, Ford, accident, 239, 38.6, 5. 40. (28) Bobby Labonte, Toyota, accident, 161, 37.2, 4. 41. (39) Tony Raines, Chevrolet, brakes, 128, 29, 0. 42. (41) Johnny Sauter, Ford, brakes, 103, 31.4, 0. 43. (40) Scott Riggs, Ford, brakes, 92, 25.8, 1. Average Speed of Race Winner: 107.573 mph. Time of Race: 2 hours, 57 minutes, 2 seconds. Margin of Victory: 0.533 seconds. Caution Flags: 7 for 37 laps. Lead Changes: 19 among 11 drivers. Lap Leaders: R.Newman 1-2; K.Kahne 3-31; M.Truex Jr. 32; J.Yeley 33; K.Kahne 34-35; M.Truex Jr. 36-108; M.Kenseth 109; J.Gordon 110; B.Keselowski 111-112; J.Logano 113; D.Earnhardt Jr. 114-129; M.Truex Jr. 130-152; M.Kenseth 153-165; M.Truex Jr. 166; J.Gordon 167-201; D.Earnhardt Jr. 202; C.Bowyer 203-207; M.Kenseth 208-246; J.Johnson 247; M.Kenseth 248-300. Leaders Summary (Driver, Times Led, Laps Led): M.Kenseth, 4 times for 106 laps; M.Truex Jr., 4 times for 98 laps; J.Gordon, 2 times for 36 laps; K.Kahne, 2 times for 31 laps; D.Earnhardt Jr., 2 times for 17 laps; C.Bowyer, 1 time for 5 laps; B.Keselowski, 1 time for 2 laps; R.Newman, 1 time for 2 laps; J.Johnson, 1 time for 1 lap; J.Logano, 1 time for 1 lap; J.Yeley, 1 time for 1 lap. Top 12 in Points: 1. M.Kenseth, 2,111; 2. Ky.Busch, 2,097; 3. J.Johnson, 2,093; 4. C.Edwards, 2,075; 5. G.Biffle, 2,073; 6. K.Harvick, 2,072; 7. Ku.Busch, 2,071; 8. J.Gordon, 2,069; 9. R.Newman, 2,064; 10. C.Bowyer, 2,063; 11. D.Earnhardt Jr., 2,049; 12. J.Logano, 2,042.